Wednesday December 10th 2014, Club meeting. 33 members, 2 guests and 2 prospective members attended. £100 has been donated to the Royal Naval Association Club. The next club monthly meeting, on Wednesday the 14th of January 2015 will also be the club Annual General Meeting. Any members who have topics to discuss at the AGM please email these to the secretary for inclusion on the agenda. The committee for 2015 will be decided at this meeting, so please consider who you would like to see in the various committee positions. These are :- Chairman, Vice Chairman, Secretary, Treasurer, and three other general committee members. The current Chairman will be resigning so nominations are required for this post. Once again we have a full schedule of digs for the club at our farms. Members must keep to this schedule as given on the Club Digs sheet. Any changes to this schedule will be announced on the club website. Katie, our Finds Liaison Officer ( FLO ) was in attendance at this meeting dealing with members finds. Katie was presented with a bottle of wine and chocolates by the club as a thank you for her services to the club during 2014. Two prospective new members attended the meeting. Their membership was proposed and seconded by existing club members. There are a few more offers of membership pending for those people at the top of the waiting list, but no more new members will be taken on for 2015 due to the limited number of places available within the club limit of 50. Some interesting finds have been made recently by members on our farms. Some of these were shown and discussed at the meeting. A copy of the 2012 and 2013 Portable Antiquities Scheme Annual Report were given to the club by the FLO. If you wish to consult/borrow these, see the secretary. As usual, the December raffle was a big success and brought in funds for the club. The next meeting will be after Christmas when many of you will have those unwanted presents, so please consider bringing them along to the January meeting and donating them as prizes. Next meeting Wednesday 14th January 2015, usual venue. Club monthly meeting, Wednesday 12th November 2014. 35 members attended this meeting. The new phone number and email address for our FLO Katie are not yet known, but Katie plans to attend the December meeting so we should have that information at that meeting. The club Christmas dinner will be on the 6th December 2014. 36 members and guests have booked to attend. The Rosemary Foundation Christmas Fayre will be at East Meon village hall on the 29th November, starting at 10.00am. The club will be there to present a cheque for £500 to the Foundation. It was agreed at the meeting, by the committee and the members present, that, on this occasion, the Charity Fund would be topped up to 500 from the club funds so that we could present this amount as usual. The land search at Dibden Purlieu was carried out, by 5 members on the first day and 3 members on the second day. A handful of pre-decimal coins and one or two modern artefacts were found, but nothing of historical interest or value. Members were reminded that at Site S only grass fields, plus the fields shaded in green on the latest map, could be detected upon. One again there was a report of unfilled holes being found at Site Q. These were not the result of Solent MDC activity, but members are again reminded to ensure that holes are filled and levelled of at all times. NCMD/FID. Details of how to join the new FID are on the website www.fid.org.uk . Payment is through Pay Pal or cheque. Members are reminded that they must renew their membership so as to have insurance for the new year. For those who do not have access to the internet, you can contact the secretary of Solent MDC for details. The raffle once again resulted in a good contribution to the club funds. Thanks to those who contributed prizes. At the next meeting we will, as usual have the bumper Christmas Raffle. If you would like two free tickets for this raffle then note that the first four members to email me at the club email address, with the subject line "Christmas Raffle" and include their name and membership number in the text, can claim two free tickets from me at the December meeting. Once again, quite a few interesting artefacts have been found since the last meeting, both on our own farms and elsewhere. Club monthly meeting, Wednesday 8th October 2014. Attended by 31 members. Members were reminded that the Rosemary Foundation Christmas Fayre will be held at the East Meon Village Hall on Saturday the 29th of November 10.00pm to 12.00pm. The club hopes to present a donation to the Foundation at this event. Please support this event if you are able. The news on FID is that it is to be taken over by Central Searchers. A web site has been started and the instructions for FID membership application or renewal are outlined on this website at www.fid.org.uk. No application will be accepted before the 1st of November 2014. At the next SolentMDC meeting members will be told how to renew or apply for FID membership, but please do not attempt to to apply before the 1st of November. This years Christmas dinner will be on the 6th December at the Langbrook Farm Inn, Havant. To book a place at this event members should contact the club via the usual email or phone numbers. The menu choices can be found on the Notice Board page of this website. Please select your choices and contact the club with your name and menu choices. Members are reminded that this event is free to members but guests must be paid for. The chairman once again reminded members that he will be standing down at the end of the year and a new Chairman will need to be elected. Any member who feels he/she can take on this role is asked to contact the committee. The members were also reminded that our FLOs next attendance will be at our December meeting. The Find Of The Month competition has not been held for some time and it is hoped that finds will be put forward at the next meeting to give someone a chance to win this prestigious award. There is no cash prize, but the winner can proudly display the certificate to impress their metal detecting colleagues. Please note that 'Site M' is not available for detecting until further notice. The clubs finances are in a good state although there may not be enough in the charity kitty for our normal Christmas time donation to the Rosemary Foundation. There is a possibility if topping up the amount from the club's own funds if the committee/membership agree. It is hoped to make this decision at the next monthly meeting. The source of the club funds is mainly the raffle held at the monthly meetings. This continues to bring in a good profit for the club, but is dependent on the skill of our two raffle organizers to to acquire good but profitable prizes and also the goodwill of members who donate prizes. Any relevant magazines, unwanted gifts etc are always welcome. Please Note :- the next monthly meeting will be on Wednesday the 12th November 2014 at the usual venue. Club meeting, Wednesday 10th September 2014. 23 members attended. A member had lost a silver pendant, possibly at the club venue. If anyone has found one, could they please let the club secretary know. The Christmas dinner will be at the Langbrook Farm Inn, Havant and has been booked, for 30 members. Details, date and time will be announced on the web site. Anyone wishing to attend, please let the club or the organizer know. The chairman will be standing down at the end of the year so the position will be vacant. Anyone prepared to take on this post please let me know. The Brighton & District Rally was attended by two club members. A report on this rally will appear on the website shortly. The list of club digs for this month have been posted on the website as usual. For those of you who attended the meeting and have the pink sheet detailing the digs, please note that Site Q is available on Sundays only, not at 'any time' as stated. The FLO, Katie, attended the meeting and was busy recording member's finds. Please note,- The next visit by our Katie will be at the December meeting. Also, some reorganisation of the PAS at Winchester is due to take place in the coming months, so Katie's email address and phone number will change. Members will be informed about this as soon as possible. The club finances are in a good state, mainly due to the proceeds from the raffle. We would be grateful for any donations for raffle prizes. 'Treasure Hunting' or 'The Searcher' magazines of any age are welcome. Our next meeting will be on Wednesday the 8th of October 2014. Usual venue, usual time. Monthly meeting Wednesday 13th August. 2014 This meeting was attended by 36 members. This month sees all of our farm back on the list for detecting, crops having been harvested and drilling not yet started. The possible rallies that the club could attend this year were reviewed but no firm decision made as yet about which we would attend. No news yet on the situation with FID. If the FID is not taken over by Central Searchers we may have to join the NCMD. This year the Christmas meal will be at Langbrook Farm Inn, Havant. [Turn off the A27 towards Langstone and Hayling Island ( The A2023, Langstone road ) and you will find it on the right after a few hundred yards.] Date and time to be arranged. See the Notice Board page for details of Langbrook Farm Inn. The Chairman announced that he will be standing down at the end of the year and members should consider who could be the new Chairman. It was suggested that one of the newer members should take the post of Chairman and perhaps bring some new ideas and organization to the club. The club finances are in a healthy state, thanks mainly to members supporting the club raffle and income from detecting on our farms. Next meeting Wednesday 10th September 2014. Monthly meeting Wednesday 9th July 2014. 26 members and 2 guests attended. It was noted once again that some members are failing to sign in when they attend these meetings. Signing in is important for both insurance purposes and club membership continuation. The treasurer reported that funds are in a good state, both the charity and club funds. Rallies:- The chairman stated that the club would not be attending the Brighton rally at Possingworth this year, but we were still looking for a rally to attend as a club with mini-bus provided in the usual way. Members might be interested in the following Rotary Club rally, although it was thought that the distance was too great for club attendance. 21st Sep 2014 Charity metal detecting day! The Midlands Federation of MDC�s & Rotary International. 9.30am � 4.00pm Entry �15.00 each (Pre-booked tickets only), �20 on the day. Send a �15 cheque or postal order (NO CASH) made payable to John Wells. 78 Watersmeet Road, Wyken, Coventry, CV2 3HT and include a SAE quoting your current NCMD/FID membership number and a contactable email address to reserve your ticket. Information from Central Searchers suggests that they are continuing to look into taking over the FID organisation, including the provision of insurance and will have things sorted before the end of the year. The club was asked to do a search for a lost wristwatch and one of our members arranged a visit to do a search, but the watch was found by the owner ( eyes only ) prior to the search. However, the owner of the watch was grateful for the offer to search and sent a £20 donation the the Rosemary Foundation. Our thanks to the member who was prepared to do the search. Christmas may seem a long way off, but we do need to book early for our Christmas Dinner, so please think about whether you will be attending, where you would like the event to be held etc. and let the club know by the August meeting, - either at the meeting or by emailing me. Thanks. Next meeting will be on the 13th August 2014. Monthly meeting,- 11th June 2014. 25 members and one guest attended this meeting. Once again members are reminded that all must sign in when attending the meetings. Both the club attendance sheet and the RNA club book must be signed. The Brighton rally this year will be at Possingworth and will be held on the 7th of September. The rally will be in the same area as for the 2011 rally and the same facilities provided. See the Notice Board of this website for details. The club has been promised tickets at the pre-booked rate of £13-50. The club may be running a minibus if sufficient interest is shown by members, although we are still looking for other rallies to attend this year. There is the possibility of a rally in Wiltshire, although final details have yet to be sorted. Between now and the next meeting there is just one Sunday without a dig. Farms are available for the remaining three Sundays, - see the digs list on the Members Only page as usual. Please note, - Our FLO Katie Hinds plans to be at the July meeting, so bring along all those finds for identification/recording. A club member expressed his thanks for the £50 donation to the Rocky Rollers charity event and reported that about £1000 in total had been raised. The raffle held at each meeting continues to bring in a good income for the club. Please note that members are expected to purchase at least one ticket as their contributions to club funds. And, - did you know that there will be two free raffle tickets available at the July meeting to the first three members who email me with their name and membership number with the subject 'Raffle Tickets'. Just send your email to me and claim your tickets from me at the July meeting. All members, - please leave the meeting room tidy when you depart, i.e. all unused raffle tickets removed, all glasses returned to the bar and please do not leave any rubbish. Thank you for your cooperation. Next meeting will be on the 9th July 2014 at the usual venue. 14th May 2014. Monthly meeting. 23 members attended. Members were reminded that our FLO's next visit would be at the July meeting. At this time of year few farms are available for detecting. The only one available between now and the next meeting would be on the 8th of June. There have been complaint from the farms that holes dug by detectorists are not being filled. The following note has been placed on the dig list for this month and members should read and take note. It is, after all, just common sense and courtesy so ignorance of the rules is no excuse. It could not be clearer. By accepting membership of the club you have agreed to fill in any holes you dig and, as far as possible, return the soil to its former state, leaving as little trace of you activities as possible. If this is not done we may lose the land on which we have the privilege and permission to search. The club presented a cheque for £50 to one of our members as a donation to the chosen charities for which the 'Rocky Rollers' were doing a sponsored mobility scooter run. The treasurer reported that club funds were in a healthy state and the charity fund will hopefully provide a second donation of £500 to the Rosemary Foundation this year. Club meeting, 9th April 2014. This meeting attended by 21 members. The Chairman reported that on Saturday the 5th of April 2014, five members of the club committee attended the Rosemary Foundation Easter Craft Fayre at East Meon village hall and presented a cheque for £500 as a donation to the Foundation. Photos of the presentation have been sent to the Foundation and hopefully one may be published in the Foundation newsletter. The Foundation was, once again, reminded that if they could make land available to the club, then it would be a further source of income to them by way of donations from the club. As most farms have seeded their fields and the lambing season is under way, there are fewer farms available for detecting. Although there is only one week with no farm on the list between now and the next meeting, next month will see a shortage of land to detect. One member reported that there was the possibility of a rally at the end of September. The FLO attended the meeting and was kept busy with finds. Club monthly meeting, 12th March 2014. This meeting was attended by 32 members and 1 guest. New members were welcomed to the club. The chairman stated that the club now has the maximum of 50 members as permitted by the rules. No more new members would be considered until the end of 2014, and then only if some vacancies had been created. New members would then be by referral and would need to be proposed and seconded by existing members before acceptance. The news of FID is that it will be taken over by Central Searchers. The following details are all that is known so far. Announcement from Central Searchers, re. FID takeover. FID ANNOUNCEMENT TO FID MEMBERS. March 2014. 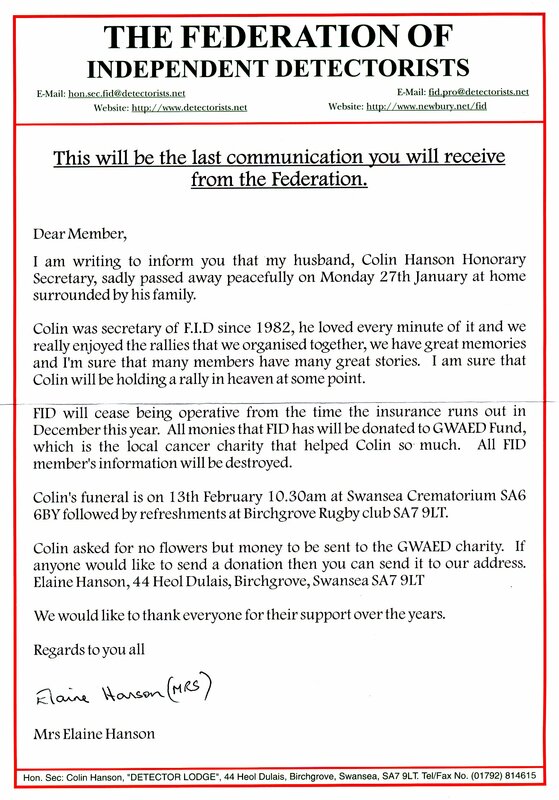 As most of you are aware Colin Hanson passed away in late January. At the time we decided to look into offering an alternative 3rd party liability insurance so there was a choice of groups to go with. Out of politeness and etiquette we contacted Colin's family, with various discussions over the past month. We have taken over FID itself with the family's blessing. At present the whole system is on a card file index so there is a lot of work to transfer data onto a database, so please understand we have lots to do so please have patience with us if you have outstanding payments for renewal etc. we will deal with them ASAP. You were informed by Elaine that you will be covered until the end of this year, which is still the case, this will give us enough time too sort things, change all the stationary with all the new details, etc. for now we will adapt what we have. For this year you will not receive any bulletins, these will start again in 2015 if all goes to plan. We did not take over any finances from Colin and his family, all that is left in the account will be donated to cancer research as requested by Colin, so we are starting completely from scratch financing things ourselves. We will be having a dedicated phone line installed the number is yet to be issued, you can get us on mobile number 07944 464822 or email fid.cs@virginmedia.com. This is so that it separates it from our home life and Central Searchers. At Elaine's request do not contact her any more regarding FID all enquiries to us. Kind regards Richard and Gill Evans. Once again members are reminded that they must sign in when attending the monthly meeting. Both the Solent MDC club sheet and the RNA club book must be signed. Our club charity funds are in a healthy state and it is proposed that we make a donation to the Rosemary Foundation at their Easter Craft Fair at East Meon on Saturday 5th of April 2014. Anyone with knowledge/experience of this type of coil, please pass it on the members. The raffle continues to provide income for the club. The annual membership fee and the raffle income are the only source of funds for the club. All other income, for example, the dig fees, are put in the charity account. While on the subject of the raffle, don't forget to bring in those unwanted items to donate as prizes. Old detecting magazines are welcome, especially as we have new members, some of whom have only just started on this interesting hobby of metal detecting. There were an unusual number of interesting finds this month. The remainder the meeting was devoted to discussion of these finds. Members are reminded that Katie Hinds, our FLO, will be at the April meeting. It has been pointed out that the Guestbook/Forum pages of our website are not used by members so I will attempt to make these more comprehensive and user friendly, and look forward to your contributions. Club meeting , February 12th 2014. There were 22 members at the meeting. The chairman welcomed four new members. We now have our full compliment of 50 members and will not be taking on any more members until December 2014. The following letter has been received by our FID members. The FID insurance will be valid until the end of the year, but after that we will need to obtain alternative insurance for our individual metal detecting activities. One way would be for members to join NCMD. This would keep us in line with the club rules. The club will advise when the situation with FID becomes clear. Our own insurance to cover Public Liability for all other club activities is now in place and cover commenced on the 31st January of this year. members were invited to inspect the documentation for this insurance. Information on the 18th Rotary Spring Metal Detecting Rally were presented. This can be seen on our Notice Board web page. Please note, our FLO will next visit the club at our April meeting. January 8th meeting and Annual General Meeting,- This meeting was attended by 31 members and 2 guests. Chairman's report,- The chairman welcomed the new members. Some of the main events of 2013 were, A new FLO ( Katie Hinds ) started with us at the beginning of the year, the Brighton Club rally at Scallow bridge,- a talk by Hampshire constabulary on 'Crime in the countryside', with special reference to ,'Nighthawking', and the Christmas dinner at the Staunton Arms Harvester. There were two charity donation made this year, £100 to the Royal Naval Association Club and £500 to the Rosemary Foundation. The committee have re-written the club rules, with special reference to,- taking on new members and obtaining public liability insurance for the club. These revised rules will be put before the membership at this AGM. Treasurer's report. The treasurer presented the end of year balance sheet and stated that the funds were in good order, although there was some way to go before we had enough in the charity account to present another donation of £500 to the Rosemary Foundation. The existing committee were re-elected to serve during 2014, with Committee member 5 becoming Vice Chairman. Changes to the club rules. - a return to the former method of recruiting new members by referral by existing members and all new members to be proposed and seconded by other existing members. Also, the area from which the club accepts members is defined as an area of radius 20 miles of Waterlooville. - the committee must arrange and maintain club insurance to cover public liability for club activities. - members must attend a minimum of 4 monthly meetings, during the year, in order to qualify for their membership continuation in the following year. - The information to be displayed on membership cards defined and membership cards to be dated for the year in which they are valid. In order to comply with club rules and to be covered by club insurance, three permanent club guests will need to be made honorary club members. There being no further business raised, the formal business of the AGM was concluded. The Finds Liaison Officer, Katie Hinds, was at the meeting to advise and record member's finds. At the end of the year there were 12 vacancies for membership, so 12 new members were recruited from the waiting list. Therefore the club has it's full complement of 50 members and will not be considering any more new members for 2014. The monthly raffle continues to bring in funds for the club and members are reminded that, apart from our membership fee for the year, this is our only source of income for the club. Important notice for members,- Katie Hinds our FLO will not be at our March meeting. Her next visit will be at our April meeting.